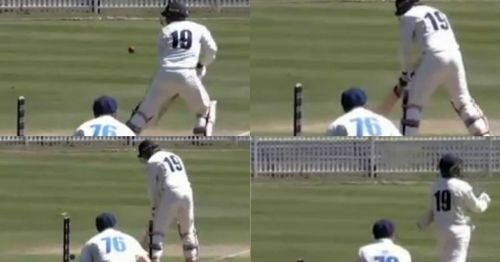 Currently out of favor Australian pacer, James Pattinson lost his wicket in the weirdest manner while batting for the Victoria men's team against the New South Wales Blues in the JLT Sheffield Shield. Making his return to the Sheffield Shield, Pattinson came out to bat at No. 8 with the Victorian team struggling at 64/6. However, he could not lift his side out of trouble as he lost his wicket due to his hard luck. Victoria had won the toss and elected to bat first against the New South Wales Blues in a Sheffield Shield match at the Drummoyne Oval in Drummoyne. The Victorian side got off to a horrendous start as their top order could not tackle the New South Wales bowlers. Victoria lost their 6 wickets for 64 runs, which invited James Pattinson to the crease. To make matters worse for Victoria, Cameron White was the seventh bastman to be dismissed when the scorecard read a mere 75. Peter Siddle then joined Pattinson in the middle. In the 47th over of the Victorian innings, Pattinson guided a ball from Trent Copeland straight into his stumps while batting at the score of 8 runs off 34 balls. He first tried to defend the ball but the ball went behind him. In order to save the ball from hitting the stumps, Pattinson tried to alter its direction with his bat. But the movement of the bat instead guided the ball straight into the stumps as Pattinson lost his wicket in a bizarre manner. Victoria were all out for just 106 runs in the first innings but their bowlers made a superb comeback in the match as they restricted New South Wales to 97/7 before the end of the first day's play. Going into second day, Victoria would like to finish off the tail of NSW quite cheaply and would then look to bat well and take a handsome lead in the second innings.